If you dig jazz and blues with an old style flavor, then you might be interested in Wiseman’s Rag. All thirteen of the original songs on this CD, several of which are instrumentals, contain the primary hallmarks of jazz – horns, wild variations in musical meter and tempo. Add to that a certain atmosphere that is associated with vaudeville acts and you’ll have a good idea of what to expect on this album. The leading and title track Wiseman’s Rag , perfectly explains what it is all about. And maybe it doesn’t at all! The Rag is a bit of a forgotten blues or Jazz style and refer to days gone by. In many cases the music on this album fits that idea, but not always/ Take for instance Fairmount blues, a rich and beautiful instrumental that in style is quite much more modern then the leading track. It’s Jazz of course but there is a gap of a couple of decennia between those two at times. Rosenblatt masters the Harmonica, which is not really known as Jazz instrument as well so yes his Jazz sounds a bit bluesy at times. And yes his music is out of category, but by know this was clear I suppose. On “C Harp Blues” he goes deep into the blues with his harp while Joe Grass (guitar) together with Joel Kerr( Bass) and Even Tighe (drums) lay down a superior jazz groove. It is the conclusion of both that is so surprisingly good. 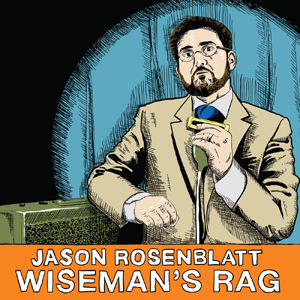 Jason Rosenblatt’s Wiseman’s Rag definitely is so meting to seek out if you are into Jazz music, but mind you it’s not the kind of Jazz you can easily categorise, but on the other hand that’s the way we like it.